Listed here are blog entries, pages, and links to marker lists which detail the historical markers located on Civil War battlefields. For the most part these are logical groupings based on either geographic proximity, locations on tour routes/trails, or military formations. 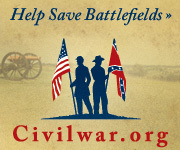 The intent is to offer “virtual tours” of the battlefield by way of historical markers. A “tour” may cover an entire battle (where the number of markers is small) or just a segment of a larger battlefield. Each tour set offers between three to thirty marker entries. The individual marker entries vary in quality, however. The best entries offer not only a photo and text on the marker, but also subject and area photographs in order to reinforce the interpretation. The entries also offer links to more information about the events discussed on the marker. These marker entries are the products of the time and toil of many different contributors at Historical Marker Database. If you like what you see there, please feel free to help out. If you have corrections to the content, better photos, or more detailed explanations, those are all welcome additions. Simply follow the instructions on the web site to add comments, photos, or links. For now the list presented here is in geographic groupings – by states. That may change and different sorts may be added later. The evolution of a “tour” progresses form a simple related set of markers (with corresponding map view), usually up to a blog entry reviewing the tour or trail, and then finally to a full page on the battlefield. The listing is a work in progress and will be updated as time permits. Pea Ridge (map) – Battle fought March 7-8, 1862. Several markers related to the Trail of Tears within the park. Prairie Grove (map) – Fought December 7, 1862. Markers within the state park tour. Fort Stevens (map) – the only D.C. battlefield, where Jubal Early’s July 1864 raid came to an end. Defenses of Washington (map) – Series of markers in DC, Virginia, and Maryland related to the fortifications which protected the Washington, D.C.
Anderson’s Raid (map) – At the end of this selection of markers are several related to the individual raiders, noting their homes and final resting places. Fort McAllister (map) – In addition to markers concerned with the December 1864 battle, the tour includes markers which reference the 1863 naval actions at the fort. Richmond (map) – Battle fought on August 30, 1862. A Confederate victory that opened the way to the Ohio. Antietam – A page listing all the marker relations for the Antietam campaign. It is possible to follow the campaign from the Chantilly Battlefield to Shepherdstown by way of markers. In addition to geographical groupings, sets related by divisional formations are offered. Monocacy (map) – Beyond the driving tour, Monocacy Battlefield offers three walking trails. While pressured by development, the field is a crown jewel of preservation efforts! Fort Macon (map) – Besiged by Federal in April 1862. Occupied by the Federals for the remainder of the war. Gettysburg Campaign – (In Progress) – Page detailing marker and monuments related to the Gettysburg Campaign and Battle. Hanover (map) (blog) – Excellent walking tour of downtown Hanover. The battle was a cavalry contest during the Gettysburg Campaign. Monterey Pass (map) – Rear guard action during the retreat from Gettysburg. Fort Sumter (map) – In addition a marker at nearby Fort Johnson notes the first shot of the war, and a memorial in downtown Charleston honor the fort’s Confederate defenders. River’s Bridge (map) – A set of markers near Ehrhardt, South Carolina, at the River’s Bridge State Park which interpret this relatively small battle. Some have called the action the only major resistance to Sherman’s march through South Carolina. Fort Dickerson (map) – A set of markers interpreting this fortification within the defenses of Knoxville, Tennessee. The fort was tested in November-December 1863 by Confederates under General James Longstreet. The locations of interpretive markers for this site are estimate, pending further site visits. Fort Donelson (map) – In Kentucky, along the Tennessee River, is a state marker indicating the site of Fort Heiman. Markers within the “Land Between the Lakes” point out the location of Fort Henry and discuss the Federal advance to Fort Donelson. Appomattox Station (map) – April 8, 1865 battle that cut off the retreat of the Army of Northern Virginia. Appomattox Court House (map) – Covering the sites related to the final surrender of the Army of Northern Virginia. Ball’s Bluff, Leesburg (map) – On October 20, 1861 a Federal reconnaissance triggered a chain of events leading to a small battle with many lasting effects. Brandy Station (map) – tour includes several markers for the 1864 Army of the Potomac Winter Encampment. Cedar Creek, Virginia (map) – October 19, 1864. The Cedar Creek battlefield is under pressure from nearby mining projects. This set of related markers follows the driving tour guide of the battlefield. Cedar Mountain (map) – On August 9, 1862, Jackson started what would become the Second Manassas Campaign at this battle. This set includes interpretive markers at the Battlefield site and several Virginia State markers outside the battlefield. Five monuments from the Culpeper National Cemetery are included, referencing Federal activity at the battle. Chancellorsville – A page with links to ten virtual tour sets. Chancellorsville’s battlefield overlaps battles at Fredericksburg and the Wilderness. While spread out enough to require driving between tour stops, the park offers four great walking trails. In addition the CWPT First Day battlefield is worth a stop. Chantilly or Ox Hill (map) – Battlefield site overtaken by urban expansion. Fishers Hill (map) – September 22, 1864. Follow up victory for Sheridan over Early in the 1864 Valley Campaign. This set includes markers from the CWPT Fishers Hill site. Fort Mayfield, Manassas (map) – Never tested directly, Fort Mayfield was part of the fortifications which sprang up around the railroad junction at Manassas following the 1861 battle there. Front Royal (map) – A running battle fought on May 23, 1862 as part of Jackson’s Valley Campaign. Kernstown (map) – The majority of this set cover the March 23, 1862 battle of Kernstown. However a few reference the Second Kernstown fought on July 23, 1863. The markers cover the Pritchard Farm and Rose Hill sites. Lynchburg (map) – Eleven entries, mostly from the Civil War Trails series, provide interpretation for this June 1864 battle. Malvern Hill (map) – The last of the Seven Days. 38 markers covering the battlefield. Manassas (First) – Set of trails related by markers for First Manassas. Mine Run (map) – Four markers which discuss the closing campaign in the Eastern Theater for 1863. Sailor’s Creek (map) – One of the last major battles in Virginia. Spotsylvania Campaign – Seven virtual tours organized by stops on the park route. Trevilian Station (map) – Set in the rural central Virginia countryside, this battlefield is strictly a driving tour. Wilderness Campaign – Five virtual tours cover the opening battle of the Overland Campaign. Camp Allegheny (map) – one of the best preserved battlefields, including fortifications and winter encampment. Camp Bartow and the Battle of Greenbrier River (map) – Sharp action fought on October 3, 1861 for control of a section of the Staunton-Parkersburg Pike. This is a precursor to the battle of Camp Allegheny above. Section of original earthworks visible from road. Droop Mountain (map) – Battle fought on November 6, 1863. Fort Mill Ridge (map) – Fortifications west of Romney, West Virginia which were active during 1863. Harpers Ferry – Includes marker listings and referenced trip report blog entries. Laurel Hill (map) – July 1861 battle was part of McClellan’s West Virginia campaign. Philippi (map) (trip report) – June 3, 1861 – Also known as the Philippi Races. Most interesting battlefield artifact is the wooden covered bridge over the Tygart Valley River. Rowlesburg (map) – In April 1863, the Jones-Imboden Raid aimed to destroy sections of the B&O Railroad. Federals successfully defended the vital bridge and viaducts at Rowlesburg. The Escape, Pursuit, and Capture of John Wilkes Booth (map) – A series of markers from the District of Columbia, Maryland, and Virginia which detail the story of Booth’s attempt to escape following the assassination of President Lincoln. Craig, I am right here in Perryville, KY. I can buzz around and get you Perryville’s markers if you’d like. Let me know. Cool site. Thanks, Brad. I’ll send you an email shortly. Thanks for the link. You’ve got quite a bit of information there! Added you to the link list on the right. I’ll also be sure to reference your site as we get more Civil War related markers from Arkansas entered to HMDB.